The Outer Banks Community Foundation sends a heart-felt thank you to ALL of our donors to the Disaster Relief Fund following Hurricane Matthew, and especially to those businesses, individuals, families, and organizations that have contributed leading gifts. The Disaster Relief Fund was established in 2003 after Hurricane Isabel with a major gift from Sterling Webster III, who not only championed the fund but also encouraged others to give as he had. Therefore it is fitting that his family members were leading contributors and champions this year following Hurricane Matthew, giving both generous individual gifts, as well as corporate donations totaling $4,500 through the Ramada Plaza Hotel and the Hilton Garden Inn. 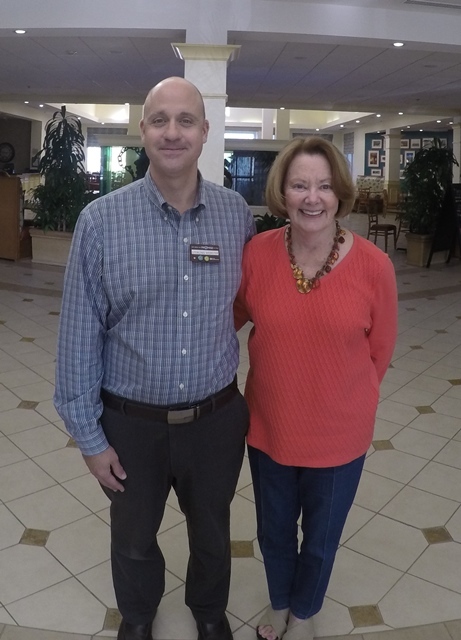 Pictured below are Sterling Webster IV and Jane Webster in the Hilton Garden lobby. Another major contributor this year was the Outer Banks Seafood Festival (pictured above), which contributed $5,000 to the Disaster Relief Fund from 2016 event proceeds. Held every year in the fall, the Outer Banks Seafood Festival honors, celebrates, and promotes the Outer Banks’ coastal seafood heritage and community. The 2017 Seafood Festival will be held on Saturday, October 21. For more information, go to www.outerbanksseafoodfestival.org. 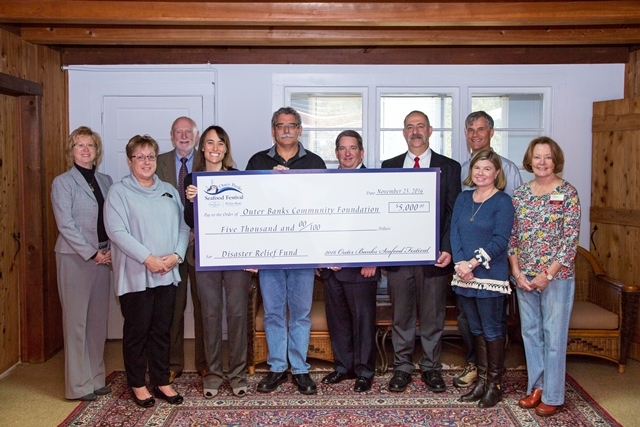 Since its inception, and through the generosity of donors, the Disaster Relief Fund has given out hundreds of thousands of dollars in grants to assist Dare County victims with temporary housing, clean up, and rebuilding after storms. Every penny contributed to the Disaster Relief Fund goes directly to victims in Dare County who need help recovering from these major disasters. Donations are still needed to help victims of Hurricane Matthew, especially for families and individuals in Frisco and Hatteras Village. Please click here to make your tax-deductible gift!